As the only foreign organization monitoring Bolivia's voter registration process, Carter Center long-term observers are witnessing a historic convergence of technology with indigenous cultures in one of South America's most diverse countries. "Bolivians are trying to implement a new biometric registry system that contains some of the latest technology, which at the same time is mixing with some of the oldest traditions in South America," said long-term observer Daniel Barnes after meeting with a group of Mallkus, who are indigenous leaders of rural communities that have maintained pre-Columbian traditions. "These groups, with their own traditions and customs, are supporting this new technology, and it's a very interesting mix." Electoral authorities faced the huge challenge of reaching out to all Bolivians with the technology – the country's population is scattered and communications and transportation are not always reliable. In some areas where there was no electricity, electoral authorities had to send generators to power the registration equipment. 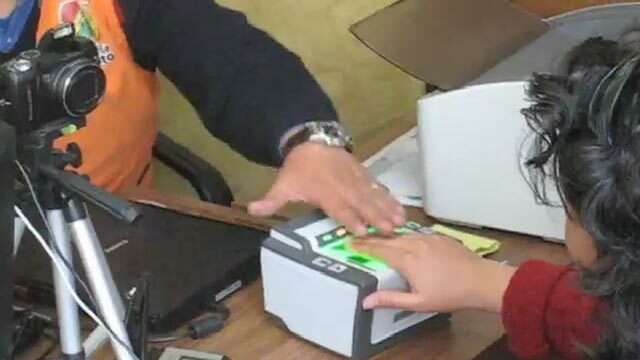 The biometric registration process, which includes the scanning of fingerprints, signatures, and photographs of eligible voters, is being conducted under a tight timeline in advance of presidential elections scheduled for Dec. 6. The voter registry is a key component of any democratic electoral process, and the biometric information improves the security of that list, ensuring that any individual will appear on it just once. Previously, citizens could register using one of three different ID documents issued by three different institutions, allowing for the possibility of people registering multiple times or even using the ID cards of deceased people. The Carter Center has six long-term observers deployed to Bolivia's nine districts to monitor the administration of voter registration, citizen participation, voter registration complaints, and related issues. Barnes and his long-term observer partner, Abril Perez, cover the regions of Cochabamba and Oruro, where they travel from community to community to meet with civil society groups, politicians, and citizens themselves. An anthropologist from Nicaragua, Perez says Bolivia is a goldmine for the subject. During their travels she has enjoyed learning about the cultures of indigenous groups and their traditions, culture, and social structures. "Citizen participation in the electoral process, including that of indigenous Bolivian women, is developing quite a bit, and we have found that people are going to register and are following the electoral process because they have hope that everything will be transparent, and they will be able to participate actively." The Carter Center plans to send a short-term delegation to join the long-term observers for Bolivia's Dec. 6 presidential and legislative elections, the results of which will determine who will develop the country's new institutional and legal framework as outlined in the new constitution, approved by referendum in January 2009.